On December 15–16, 1864, the Battle of Nashville was fought on a 1,500-acre tract of land known as the “Noel Place,” the residence of Oscar Fitzallen Noel and Sallie T. Noel. Both armies of the conflict occupied portions of the farm: The Confederates constructed breastworks diagonally through Noel Place, and Federal cannons heavily damaged the residence. When the Southern troops fell back, the Federals took possession of the house and converted it to a field hospital. 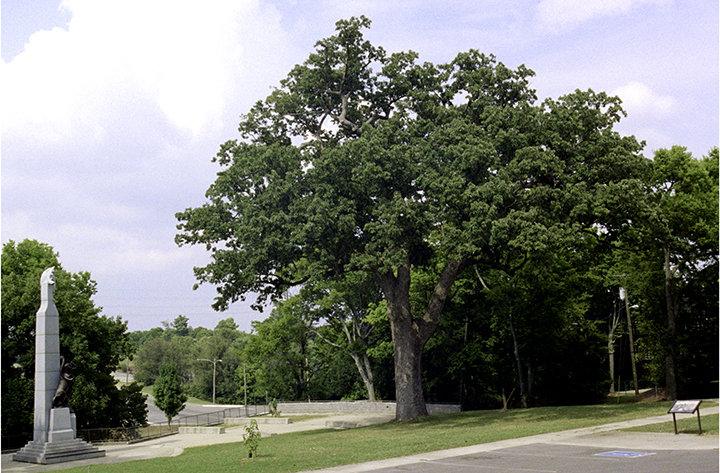 The chinkapin oak on the farm was documented through the years to have been a large tree during the Battle of Nashville. It now stands in the Battle of Nashville Monument Park on a two-and-a-half-acre tract bounded by Battlefield Drive, Granny White Pike, and Clifton Lane. A tall monument stands near the tree, recognizing those who clashed there in 1864.